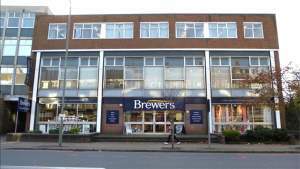 Our Bromley branch serves a balance of trade and retail customers. We have a team of longstanding members of staff who’ve built up excellent working relationships with each other and our many regular customers. We stock all the major trade paint brands as well as a large choice of designer paints and various sundries for decorators of all levels. You can also visit our home design showroom, where you can browse online over 500 wallpaper and fabric pattern books, soft furnishings and furniture from our range of home design websites – as well as Click + Collect to any Brewers branch. We offer an interior design consultation and a made-to-measure service with free check measures on curtains, blinds and all styles of window dressing. You’ll find us on the same side of the A21 London Road as the Bromley Magistrates’ Court and the Travelodge – about halfway between the two. We’re opposite Buddy’s Café and don’t worry about the red route – there’s dedicated customer parking at the back of our building – look out for the extrance and dropped kerb between us and building 29. With Tweedy Road on your right, the store is on the left with parking just before the store on the left.